You were just 17, and I was now 70 years old. Your hair shone like burnished copper and you sparkled with youth, while I faded into the winter of my life. Tantalus is a love story with a difference. The lovers are separated not by barriers of race, class or creed, but by something much more devastating – by time. They can see and can talk to each other but can never touch. Theirs is an impossible love as each is trapped in their own time and space. I need to start at the beginning – the real beginning I mean, not this brief encounter on the footpath when your mum and I were just teenagers. I need to ask you to undo the top few buttons of reality, and I need to fast forward eight years to that night of blind terror – the night I first saw the eyes in the wall. How could I stop reading after that opening! And I had no trouble at all in undoing my buttons of reality. Fast forward from 1967 to 1975 as Sylvia moves into an old house, the house she has known about and dreamed of living in since her childhood, Birchwood House. Sylvia had polio as a child and consequently has a withered leg. She is a painter, fascinated by a marble statue of a lady by the lake in the local park. She had thought of this lady as her secret friend ever since her mother pointed out that the statue had a damaged leg like hers – the statue is even called ‘Sylvia‘. Birchwood House is a large Victorian semi-detached house, joined back to back with Oakwood House. 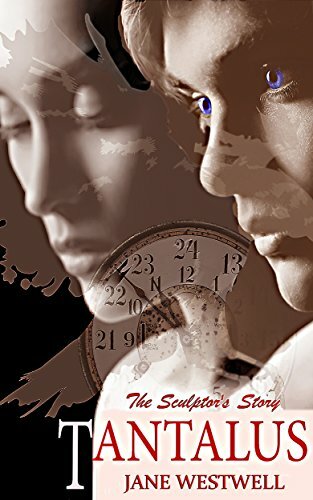 Her life changes after she moved into Birchwood and sees through the wall of her studio into Oakwood and the eyes of the young sculptor, Tom who lived there 50 years earlier. I wondered if Tom was a ghost, or a figment of Sylvia’s imagination, the result of her loneliness? But I became increasingly sure that he was a reality as Sylvia centred her life and work on Tom and somehow they were able to communicate over a gap in time. I love this painting and have a tapestry of it hanging in the hall. As I read on I began to hope that Tom and Sylvia would meet in real time, but this is not a slushy romance. It is such a poignant story, full of emotion and very moving, which I found completely absorbing. There is so much more I could write, but not without giving away too much of the plot. This is Jane Jazz’s debut novel and I do hope that she will write another book. Tantalus is a perfect title for the novel as according to Greek myth Tantalus was famous for eternal punishment by being made to stand in a pool of water beneath a fruit tree with low branches, with the fruit ever eluding his grasp, and the water always receding before he could take a drink. For more information about Jane Jazz and her novel go to her website: Tantalus. And after I’d finished reading Tantalus I realised that it a perfect fit for Carl’s Once Upon a Time Challenge. It sounds wonderful Margaret! Thanks for bringing to our attention! Wow, that sounds like a brilliant novel. Will go and look it up on Amazon. Margaret – I’m not usually one to go for romances, but this one sounds unique and very poignant. Thanks for sharing. Oh,wow. I love the writing, and the premise sounds heart-breakingly good! I love that painting too, though I never knew it’s title or name of the artist–it’s just such a Romantic, chivalric image. I don’t think this book is for me but I loved your review of it. Almost made me want to read it anyway.